Do you get wet when it rains? Can you feel the weight saving on your back? Are the tiny interior proportions worth a few fewer ounces? And, most importantly, can it contain an 85lbs, half-wild dog? We spent a week living in the 1 lbs, 9 oz Big Agnes Fly Creek 2 Platinum so you don't have to. First, we should probably qualify the lightness thing a bit. There are lighter shelters out there. The Hyperlite Mountain Gear tarp that Chris has been living in on his 'round the world adventure for the last few months weighs just 1lbs, 2 oz. Big Agnes' own one-person version of this tent weighs 2 oz less. But, as far as I can tell through my research, this Fly Creek 2 Platinum is the lightest double-wall tent that will stand up with its own poles and kinda sorta fits two-people in a pinch. So it's light, but is it…? Note the large hole in the door. Thanks Wiley. Is it strong? Or, better yet, one person and a dog, which is why I opted for the 2P. Wiley and I have tried sleeping in my old 1P backpacking tent a few times, but that invariably ends with him sleeping on my face and me not sleeping at all. Can the Fly Creek Platinum hold him? Well, the second morning into our five-day trip to the Lost Coast, Ty's dog Sansho ran past our tent at sunrise and Wiley decided he wanted to chase him. He stood up inside the tent and, in a single leap, tore the large hole in the door you can see here. So the answer to that question is "no." The reason this tent weighs so little and costs so much ($550!) is that Big Agnes has spec'd some of the thinest, lightest materials I've ever seen on a shelter. The gossamer-like bathtub floor and transparent fly are an ultralight ripstop nylon that's so thin it feels like you'll tear it just setting the tent up and are only treated with a polyurethane coating on a single side, rather than both sides as is more standard practice. The rest of the Platinum's body is a very light no-see-um mesh. Going into the trip, it was actually those drastically thin nylon sections that I was most worried about. They're colored, but so thin they are actually see-through and feel to your hand only like slightly more robust cellophane. So, it came as a surprise when it was the more substantial-feeling mesh that failed. The floor and fly actually proved far more robust than they look. The tent's hardware is surprisingly robust. Clips, straps and grommets make no durability sacrifices, pointing towards a long service life. Is it easy to use? We set up camp at 1am the first night during pouring rain. This was only the second time I'd set up the tent and doing it in the dark, in the rain, I was worried I'd get the thing soaked before I even had a chance to get in it. Luckily, with only a single pole and idiot-proof plastic clips, even I could get it mostly ready in under 60 seconds. Fiddling with the last couple stakes and clips on the sides took a little longer, but the tent was mostly protected by then. Taking it down is similarly speedy. Pull the stakes, undo the clips, remove the fly, pull the pole and roll the whole thing up. The "freestanding" descriptor could certainly be argued though. You need to stretch the tent's foot panel out to each side, then stake out the fly and clip the tent body to it in order to achieve full set up. "Self supporting" might be more accurate. It wasn't until what ended up being the last night that I was totally happy with the tent's tension. It's heavily reliant on a very solid stake out and, camping on loose mulch the first night and soft sand the next two, I wasn't able to achieve that. But, up in the mountains on firm soil, I finally achieved a level of tension that made the tent feel solid. A good thing, because that night a huge storm began to roll in that would cause us to evac the next day. Matt, pictures, is 6' 5". It's a tight fit, but it is a fit. You could never fit two of him in here though. Will you get wet? But, once it was up, it didn't stay dry inside. There's two problems here: 1) the minimal fly overlap allows falling rain to splash through the mesh body. And 2) There's no way for a tall guy like me to sleep in it without pressing my feet against the foot of the tent and my torso against its side. That results in a lot of contact with the fly around the feet (it runs super close to the tent body at that point) and exposes my sleeping bag to the splash back on one of the sides. The materials used to construct the Fly Creek Platinum also seem to be more prone to wet-through than other tents. My buddy Ty was carrying the 3 lbs, 7 oz MSR Hubba Hubba NX 2P along on the trip and setting it up and using it in identical conditions (10 feet away) the whole time. While he was packing his tent away wet too, the Big Agnes came out of the packs at the end of the day noticeably wetter and took hours longer to dry out. The fly material is so thin you can see the tent body through it. It's perfectly stable in high winds if you point its foot towards them, but side-on, that large flat area is literally a sail. Is it livable? One of the reasons to opt for a tent over a tarp or other ultralight shelter is that tents tend to be more comfortable places to spend time. The floor separates you from the cold, wet ground; the body keeps bugs out; the fly deals with rain and wind; and the vestibule stores you're gear in its own separate garage. Surprisingly, the Fly Creek actually does pretty well on the storage front. Two slash pockets on either side of the door hold large, heavy items (like a big knife and wet socks), while a pocket above the door is a great place to stash your headlamp; from there it provides perfect tent illumination. There's also an optional gear loft that clips into the roof. The vestibule is very small though, only leaving enough room for a pair of boots and maybe a small pack, at most. Elsewhere, the tent makes some noticeable quality of life sacrifices. See that big gap between the ridge pole and the tent body over your lower half? Well, that makes it uncomfortable to sleep with your head in that end. The tent is designed to be stable in high winds only with its foot pointed windward so, set up on a slope with downhill wind and your head's gonna be shoved in that mesh all night. And, if it's raining, against a wet fly too. And you can barely sit up inside the head at the best of times; just enough to change your pants. Fitting two people in here would be a real stretch. One night, Ty and our 6' 5" friend Matt snuggled in the larger, heavier Hubba Hubba along with Sansho, Ty's 65 lbs Karelian Bear Dog. Wiley and I barely fit inside the 2P Fly Creek if I brought my pack inside too and there's no way my six-foot tall girlfriend would have been comfortable in here too, much less another dude. Look at all that space between the tent body and ridge pole at the rear! Sleeping with your head back there is very tight. Is it light? It is, and it's small too. But, ultralight backpacking is more about taking a systematic approach to your gear than it is simply buying a flashy tent. Paring your needs down to a minimum, taking advantage of multi-purpose items and leaving luxuries at home is what you need to do to achieve the lightest possible pack weight. 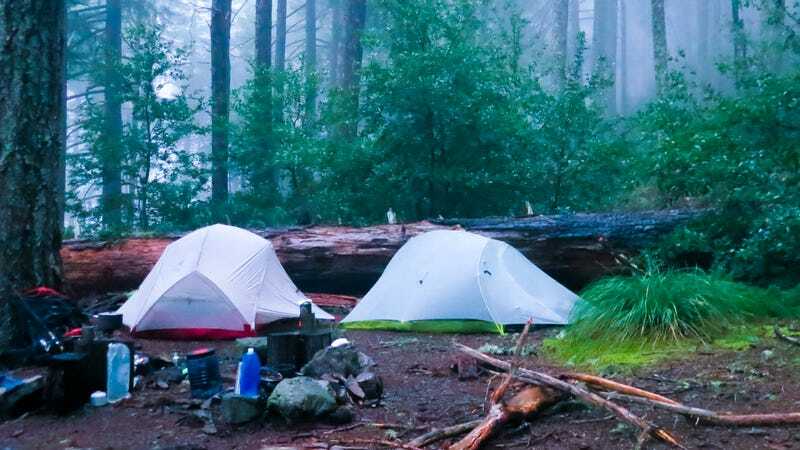 If you've already done all that and already shaved ounces off your other two "big three" items — your pad and bag — then it may be time to consider spending some extra money to shed the last few ounces off a tent. But doing so certain comes at a premium. The Platinum costs $200 more than the regular Fly Creek UL2 while only saving you 6 oz. We actually prefer the 2 lbs, 13 oz Big Agnes Copper Spur UL2 ($400), it's just that much more livable that it easily merits the weight penalty. At no point during the trip was I glad I wasn't carrying Ty's heavier MSR tent; it was our good food and pots and pans and the bottle of Pappy that made our packs heavy, not a small difference in our tents. In general I had a slightly lighter load, but that was as much due to my nicer sleeping pad, lighter sleeping bag and cuben fiber backpack as it was the sub-2 lbs difference in our tents. Is it for you? The Fly Creek Platinum was designed for a very specific user. Someone who's prepared to spend a large sum of money to achieve the lightest possible weight, but still prefers a tent over a tarp. Someone who wants to take their entire system to its lightest possible weight and is prepared to sacrifice some comfort to achieve that. Someone who doesn't own a big dog. If that's you, then there is no better tent. But, it's probably not you. The vast majority of you will be better served by other tents in the Big Agnes range.